Ode'imin translated means (Heart berry) because of it's shape. The berry in its connection to the vine, leaves and its roots are similar to our heart and its connection to all of our organs and other parts of our bodies. The plant is used to treat digestive disorders, skin problems and more. It's been used to strengthen the uterus during and after pregnancy. the fruit and leaves are an excellent source of vitamin c. The leaf is referred to as (aniibiish) which translates to tea as the leafs were used to make tea with. On a spiritual level, the strawberry can teach us many things, most importantly that all intention, spoken, thought and action need to originate in the heart, pure of expectation or desire...Also know as the medicine of reconciliation. It is often referred to as a women's medicine because it is used to teach young woman about creation, community and love. A young woman fasts from the strawberry and all berries upon entering into her first menstrual cycle. It is during this year that she will spend time with her Grandmothers ​who will teach her about womanhood and ow to bring life into the world. She will also gather berries to share with her community after her fast is completed, thus teaching her about sustenance of family and community. 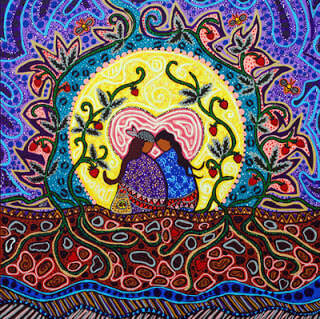 In ending please remember in sharing of the medicine the messages and the teachings of the heart berry. It's attributes also are that of "Zawenim" unconditional love, kindness and compassion. Chii Miigwetch to Rebekah and Amber for their respective roles in the inspiration of this teaching.